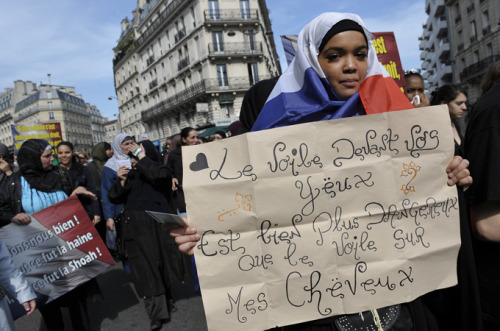 The sign of protester in France in reference to the law which places a ban on face veils. Flawless people. I can’t with this world. I just CANNOT. I want to cry. This world. What is wrong with you people. These women can’t walk down the streets of their own country, go to school, to the groceries dressed the way they want to because they’ll be fined, it’s illegal, they’ll be sent to re-education classes. Their own country. If you are a Muslim you will be judged instantly, you can’t walk down a street, can’t walk into an airport, get into a plane, tell someone what you believe in without people telling you’re a terrorist, without being judged, without being ostracized. This is what we live with everyday. Who gave you the right to tell these women what to wear and what not to wear? No one. So stop it. I’m sure you could find a ton over at Muslimah Media Watch.